In memoriam of the ground-breaking contributions of Jim Dooge, Hydrology and Earth System Sciences honours the most outstanding papers of a year with the Jim Dooge Award. Nomination and selection criteria are an outstanding scientific and presentation quality of the study. 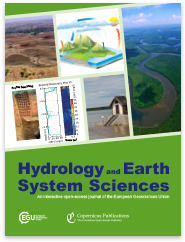 In 2015 the award was granted to the studies "Hydrological connectivity inferred from diatom transport through the riparian-stream system" by Nuria Martínez-Carreras and colleagues and "Why is the Arkavathy River drying? A multiple-hypothesis approach in a data-scarce region" by Veena Srinivasan and colleagues. To view all awardees since 2010, see Jim Dooge Award.